Radians Snug Plug Reusable Ear Plugs Corded w/Carry Case (NRR 28)3NRR28October 17, 2016This item is okay. I purchased these for myself and a few co-workers. The string pulls out of the ear plugs easily causing loss of the ear plug. They are also quick to tear in two. 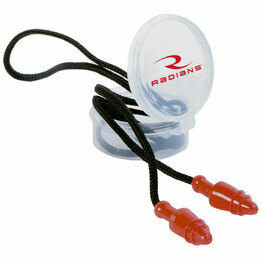 Radians Snug Plug Reusable Ear Plugs Corded w/Carry Case (NRR 28)3Don RoyerApril 13, 2012These earplugs are more jelly-like than other ones I've tried. They are very comfortable but I have trouble keeping them from coming out. They don't have a long hard stem on the end so they might be better for sleeping than some of the other types. Radians Snug Plug Reusable Ear Plugs Corded w/Carry Case (NRR 28)5matthew armitageAugust 4, 2011A perfect plug for prolonged use and extreme comfort!